Carving out some time each day for yourself can be quite challenging. A little trick I like to use to make my days much more pleasant is to find little, simple pleasures and sprinkle them throughout my day. Some days zip by so fast you barely have time to just sit and have a simple moment for yourself. And over time, I’ve learned that everyone needs those “Me Moments” each day to find a small chunk of time each day and spend it doing something that makes your heart happy. One of my favourite ways to start my morning is have a cup of coffee, and sip it slowly to enjoy it fully while watching the sun come up, and marvel at the world in pastel hues. I use those quiet moments to draw closer in my faith and scouring through pages of scripture. Keeping God’s Word at the forefront of my day goes a long way in helping me stay focused on kingdom perspectives instead of the pulls of this life. I love to snuggle up in my favourite chair with a cozy blanket and read. Reading is something I’ve always loved, but it seems that the older I get the less I make time for it. Most day’s I am curled up with my youngest reading her one of her favourite story books or listening to her read me one of her’s as she learns to read. I love reading books that take me on an adventure – make me laugh, encourage me to grow, and help me to dream about far away places. Even if it’s flipping through dogeared magazine when I am done I feel relaxed and ready to tackle the rest of the night with a happy heart. I love nights spent outside listening to the fire crackle and spit in our backyard fire pit, watching the kids roast marshmallows sticky fingers and all. You get the ideas- these are the little things that can be done throughout the day. I thought it would be fun to compile a list of simple pleasures, to give you all some ideas of what I mean, and to spark other ideas of your own. Dancing in the rain and stomping in the puddles. Fresh- baked chocolate chip cookies. A gentle breeze on a hot day. That feeling after a good workout. The possibilities are endless, and you can probably come up with a dozen more of your own “little things” that help you find the simple pleasures each and every day. I would love to hear a few of yours in the comments below. We all need to take the time to enjoy the little things. The other day, I took a little time to enjoy a nice bath and watched the bubbles form while I was in the tub. Little things like that is much needed. I definitely need to try some of your fab ideas. I am guilty of rushing through every day trying to fit in everything I need to do and not just slowing down every now and then and appreciating the little things in life. The little things that make me happy are funny things my daughter says to me. A silly video game or watching a movie that I wanted. Even watching a good movie trailer can put me in a good mood. 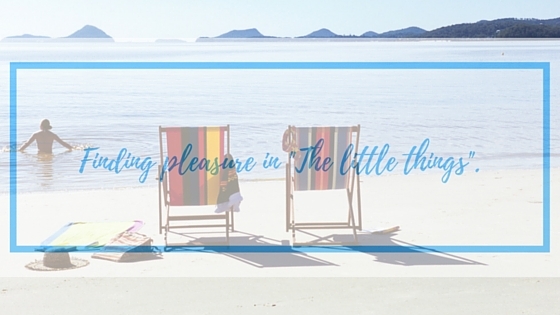 This is such a good idea, stopping and slowing down to enjoy the little things. But, they tend to not be little in your memories. My kids still talk about when we danced in the rain, with all of our regular clothes on! It stuck out to them and me and will always be special. Coffee is always a good idea! I have six kids and its so true we all need break to reconnect! Having a bit of time each day doesn’t seem like it would be that hard, does it? It really have to be planned. I too love starting with a quiet cup of coffee. I am not always very good about taking time for myself. Thanks for this wonderful reminder that many things can be celebrated and enjoyed in littler bits throughout the day. BTW, baths are my favorite. That is my biggest stress reliever. I like to wake before anyone, have a coffee and spend some time on my computer. It helps me relax. Any other time during the day is stolen moments and I do savor them! I love doing all these! Finding great joys in simple things! Love your list! I love those little recharging and filling my heart things. Sprinkles on ice cream is a big one for me! And slow walks to the mailbox, a good book, and a hot cup of coffee. Barefoot in the grass works for me. In fact, just getting outside makes me instantly feel rejuventated. Yes, it’s very important to take time to breath and enjoy your day. I like to walk around my neighborhood to clear my head, or spend time with my pets. It certainly is the little things that can really make a difference. I really love walking barefoot in the grass. Something that I used to do that re-energized me that I’ve quit doing was writing in a journal. It seemed to be so cathartic and it was almost as if when I put it down on paper, I could leave it there and move on with the next projects that I had in my life! I need to start doing it again, thanks for the reminder! Waking up early or having a quiet moment before bed and enjoying a nice cup of cocoa before bed or cup of tea early in the morning does it for me. I love my morning cup of tea. I often pick a mug that I purchased in my travels. One of my favorites is covered with shells from Sanibel Island. Youre exactly right, when I make time for these simple things it is always a good day. I always start my day outside drinking my coffee. all great ideas. I love the little moments in life. some of mine are watching my kids sleep, hearing their laughs, and the first sip of an ice cold coke. It really is great to enjoy the little things in life, glad you wrote this. It’s a nice reminder to let go and remember all that we have to enjoy in its simplest form! So many great ideas. I love them all. I do a lot of these and enjoy them and do really love and enjoy the little things. bubble baths are my little getaway. What a beautiful post about taking time to do things to keep our spirits up. I watch the sunset and it instantly put me in a good mood. Thank you for this wonderful list of ways to stay positive. I think it is definitely important that you take a little “me “time each day! If you don’t have that I think you lose yourself in everybody else’s business. Those are the kinds of things that renew my spirit! I’m with you on not having time to read as much now, but oh, how I love it. I love your perspective of appreciating the little things. 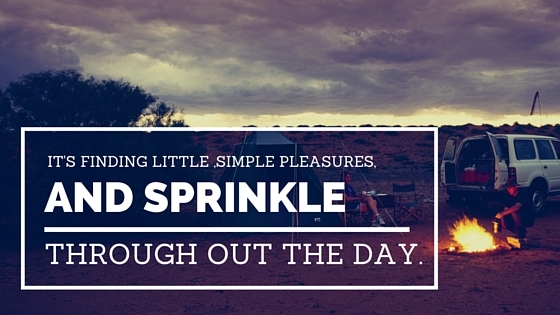 Like enjoying sprinkles on ice cream of course! I am going to a hotel tomorrow and I am definitely going to enjoy a LUSH bubble bath bomb! I love relaxing in our hammock and enjoying the fresh air. There are so many simple things that make life enjoyable. These are all great ideas. I always start my day off with a great cup of coffee and then I plan my day and figure out what will happen the rest of the day. I make sure I take a few minutes out of each day to be still and focus. These are great ideas! Lately I have been working on my family phonebooks once my son is in bed. Just looking at all the memories from the last year puts a smile on my face and is a great way to end the day. I think people in general need to take a break from their phones etc and do these things. We are becoming to addittied to technology and small pleasures are going unnoticed.